Are you entertaining family and friends for this weekend’s official summer kick-off? If so, then the grill is probably ready for firing up. Dogs and burgers are the most popular items to throw on the grill to start the summer season, but we all know it’s the fixings and sides, which make those traditional favorites. 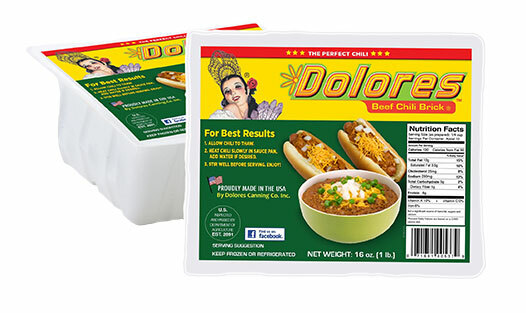 Dolores chicken or all beef Chili Brick® make a great side or topping on both burgers and dogs. Prepare Chili Brick® in a pan on the stove, add water or broth to taste, and top off your burger or dog. One 20-ounce brick makes 4-6 servings. Chili Brick (all beef) are sold at most major grocers such as Albertson’s, Food4Less, Stater Brothers, Ralphs, Cardenas or Superior in the fresh meat case near fresh poultry and ground beef. Sometimes the bricks are sold behind freezer doors as well. Smart&Final carries a larger, 5-pound tray. The chicken brick is sold at Superior and Bristol Farms locations.